Meet Mac, the newest addition to our family. 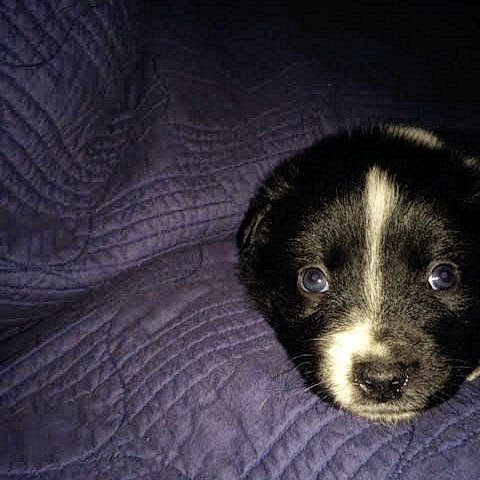 Mac is an Australian Shepherd. We brought him home at six weeks old and he is a baby. Puppies are magic. Just like human babies, they cry when they feel scared, hungry or need to go to the bathroom. They also teethe and explore, which means you have to "puppy-proof" the house so they stay safe. They also provide continuous moments of overwhelming cuteness. Pepper, our 4 year old Aussie, is being very mothering to him, though at times she looks at us in complete bewilderment as if wondering what we've done. We've been considering adding a dog to our family for awhile. We've had Bethany's border collie, Mia this semester, but Beth will take her home mid-January and I enjoy the dynamic of having two dogs. Plus, the opportunity seemed right. The family who have Sadie (Mac's mom) are "dog people" like us and talked about Sadie's smart and loving personality. (We met Sadie and she is as awesome as advertised.) So it just seemed like a perfect fit. Aussie's are working dogs and if you have them as pets they must have work to do. Pepper's jobs include keeping squirrels off the windowsill (we put food there to ensure she will have some to chase off), announcing visitors, accompanying John when he plays disc golf, going to "fetch" John so we can pray when I'm ready to go to bed, and now--apparently--watching over Mac. Of course, we always appreciate her work and celebrate her accomplishments which is fun. We will have to come up with jobs for Mac too. I can't wait to learn who he is.